Every time I run one of my Facebook classes I can guarantee that Facebook will make some changes! It happened again a few days ago when I was preparing for my latest class. This time they're rolling out changes to business Page layouts. The change you’re most likely to notice first is how you post. For anything other than a text post you have a box to click. If you used either Book Now or Learn More as your Call to Action button, you will see this option. It adds the same button and link as your Call to Action button to your post. Create an offer and post to promote it. Adds a Get Offer button to your post. This option has been appearing and disappearing from the Pages I manage for the last month. So look out for it, but don’t necessarily expect it to stay – yet! Look down the left side panel of your Page and you may notice some added tabs. 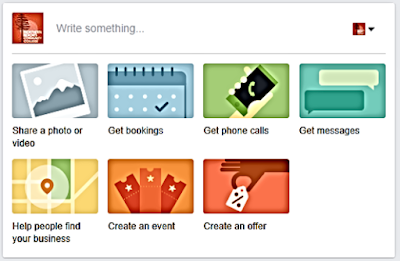 If you are a service-based business you can add a description and price for your services to your Page. Just click on Services and add your description. When you’re finished, click on Visible to display your services on your Page. You can now sell products from Facebook without using a third-party app. Choose how people are going to buy from you – let people send you a message to ask questions and arrange purchases, or send them to another website to complete their purchases. Then you can start adding your products, with a photo or video and details. At the moment, you can only sell physical products, not services or digital downloads. If you don’t see these new tabs, click on Manage Tabs at the bottom of the Tab list. At the bottom of the Edit Page screen click on Add a Tab. Click on Add Tab next to the feature that you want displayed. 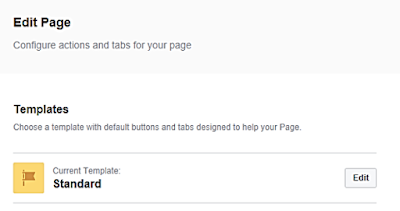 This screen is also where you can hide tabs you don’t want displayed (just click on Settings, next to each Tab), and where you can rearrange the order of each tab; just click and drag it up or down the list to its new position. While you were on the Edit Page screen, you may have noticed the new Templates section. This is not available on all Pages yet. The Templates give you an easy way of changing your Page layout to suit a particular business type. 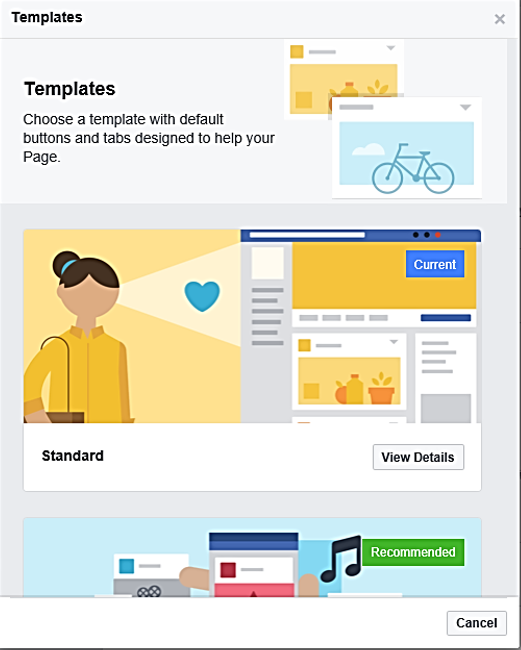 You can choose from seven templates, each of which adds different features to the Page. 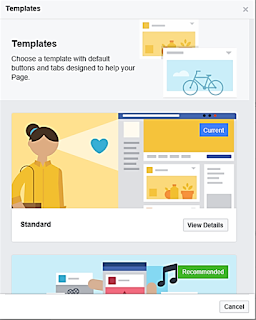 Instead of choosing the Tabs you want on your Page yourself, you’re letting Facebook choose which are most suitable for your business type. 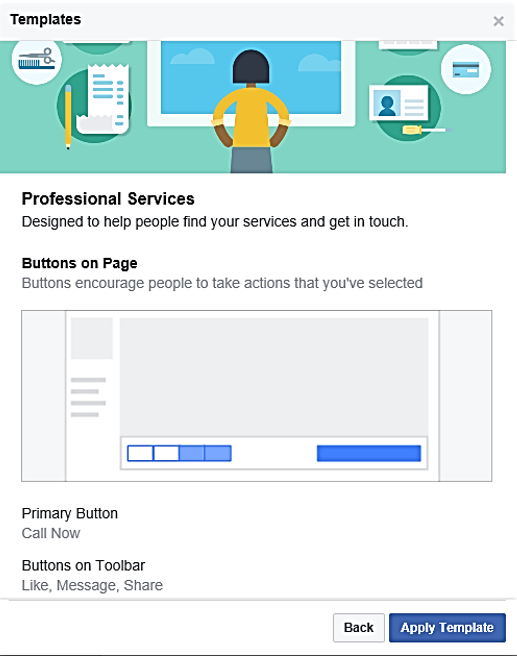 On some templates the Call to Action button (called the Primary Button in Templates) is also chosen for you. Select View Details to see what features are added with that template. Applying a template only changes the tabs on the left side panel and the buttons under your cover photo. Select Apply Template if you want to make this change. You can change back to the Standard Template or to any other template whenever you like. Have you noticed these changes or any other new features on your Page?